Audacity for Mac is an excellent application for recording and editing audio files. In here, you can learn all the great features and functionalities of this no.1 best audio recording tool in the market. Also, learn how to download and install Audacity on your Mac OS devices by following the step-by-step guide provided below. Nowadays, recording and editing an audio is in-demand and a common practice, since we can do it all by ourselves through the use of audio editing software. These tools are made available to users by downloading it for free or buying an application for our PCs. However, is there a decent audio editing software that you can install on Mac computers? Well, there is – and that is the Audacity. 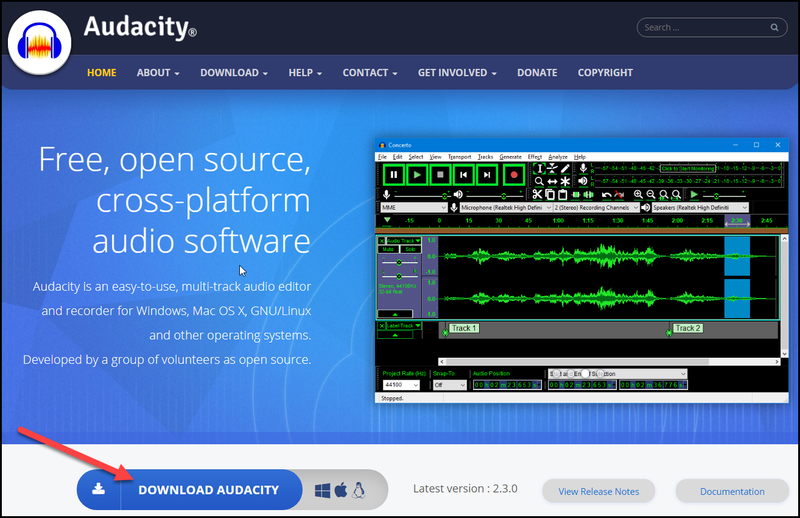 Audacity is a free and open-source software for audio recording. It comes with editing tools that can help you enhance your music or any sound project you want to produce. Having Audacity for Mac computers is one of the excellent characteristics of this application. Knowing how Apple can be very strict with their system, Audacity made its way to enter the Mac world. So, here’s how Audacity can help you make an audio file perfect and smooth as we share with you the best features and functionalities of this application. And as you learn from these free guides and tips, you can start using it on your school projects, music careers or on your business, and on your job like social media marketing. So, let’s get started. The features of Audacity are useful and functional. Since its development, it has been bolstered with new additional capabilities and “ergonomics.” Here are some of them. #1. Audacity is capable of recording a variety of sounds. It can process live audio, cassette, and even your old vinyl collections. It can also support a wide range of audio formats such as the likes of MP3. WAV, AIFF, and even Ogg Vorbis. #2. When it comes to interface, there’s a guarantee that Audacity is user-friendly. Experienced Mac users will never have a hard time navigating and toggling its features. The simplicity of Audacity enables users to copy, splice, or cut sounds without any difficulties. The program also allows users to access a myriad of special effects and filters. #3. By all means, Audacity is a versatile software. It is typically bundled with various hardware such as the turntables of ION. #4. The latest version of Audacity–the Audacity 2.3.0–is extremely stable. New Mac computers can support it. Bugs from the previous versions got fixed too. #5. The interface of the latest version of Audacity is clean. Clutters are nowhere near! It is quite different from the conventional audio editing applications in where you will get baffled and overwhelmed by their interface. #6. The clean aesthetics of Audacity is not just its main selling point. Audacity provides all the necessary controls and tools that are usable for recording and editing. People who want to produce sounds for their audio-books and podcasts can rely on the simple yet effective operation of Audacity. Now that you already have an insight about Audacity, it’s time to download it on your device and experience all the great features listed above. The steps in downloading Audacity for Mac computers are fairly easy. Just follow the steps below to download it successfully. Step 1. On your web browser, go to Audacity’s official website or simply click the link. Step 2. Click the blue download button. Step 3. Choose the platform of your device which is Mac OS. Step 4. Once the page for downloader opened, you need to click the “.dmg file” to open the page for direct download link. Step 5. Hit the link “Audacity macOS DMG.” Audacity will be downloaded automatically on your device. Step 6. Wait for a few minutes to finish the download and that’s it! Once you have downloaded the file, you are now ready to install it on your Mac device. To install Audacity for Mac, locate the file you have downloaded on your computer. Click the file to initiate the installation. While installing, you need to follow the on-screen instructions until it finished. It will also ask you to create a desktop shortcut for an easy access, go ahead and do that. That’s the step-by-step guide on how you can have Audacity as a free audio recording and editing tool on your Mac computers. There are points which make Audacity the no. 1 in the list of audio recording tool. Here are some of those points. Audacity is an open-source software. When you say open-source platform, the developers grant the users to study, make changes and distribute the software. Audacity is free. You don’t have to pay even a single cent when downloading Audacity. However, the free value of Audacity doesn’t indicate that it is shabby. You can guarantee that its performance is similar or better than those paid applications. What makes Audacity an excellent software is it runs on different platforms not only on Mac OS. You can also download it on Windows and Linux-based devices. It allows users to access different tools for recording and editing sounds. It is a simple yet functional application that offers a spectrum of capabilities for audiophiles. Plus, if you are trying to explore the world of audio editing and mixing, Audacity is a good starter software for you. So, even if you are an expert or beginner, this is a perfect program for you. Audacity for Mac is an excellent audio editing software. This free application is a viable tool for editing and recording without spending a penny. You can get all the tools you need without going over a paywall. Audacity has a clean interface, too. It is very simple to use. There are no complications on the interface, which is quite useful for us already. If you are still a novice, you can benefit from it. In fact, professionals use it in their respective fields. So why shouldn’t you? If you have been using Audacity for quite some time now, you can share with us any of your experiences why you chose this software. Also, you can ask us questions if you are having a problem downloading or using Audacity. Just leave them down below inside the comment box. We’ll try to answer you as soon as we can. As we enter into a new chapter on a new calendar year, it’s time to start thinking about effective social media marketing strategies for your small business. In order or you to stay ahead of the competition, it’s imperative for you to adjust your marketing strategy to take advantage of prevailing trends and the ever-evolving market for various business industries. The small business platform has changed a lot in the last few years and staying up to date with those changes can be a challenge.